The New Year is fast approaching and even though there are many areas in need of improvement, on principal, I refuse to make any resolutions. I mean, why does it make any sense that I could tell myself to eat less sugar, be more forgiving or whatever life altering change I need to do on January 1st that I couldn’t motivate myself to do on December 1st? I guess it’s the old, I’ll-start-being-a-better-person on Monday, deal. As if Monday signifies a fresh start that you could never pull off on a Tuesday. Crap, if you screw up Monday, you’ve blown it, might as well go about your business of screwing up, generally with renewed vigor since you now know your time as a screw-up is limited, and try again next week. That’s the power of Monday; knowing that you have an opportunity to wipe the slate clean but the freedom of knowing that if you don’t, you can have a donut party by lunch and it’s all good. New Year’s resolutions are Mondays on steroids; the biggest, baddest Monday on the block. If I were to make any resolutions, they’d be the same boring things I’ve needed to work on my whole life – lose some weight, be more patient, do more for other people, appreciate, appreciate, appreciate… I’m not a total failure on all accounts, but it’s the areas that can always be improved. It’s kind of like when I get to wish on a first star or a birthday cake, I’ll always choose the safe, expected wish. You know it, the ‘good health for your family’ wish. Heaven forbid I’d ever wish for something like getting my manuscript published, skin that doesn’t look like a chicken waiting to boil or for my father to sucker, I mean find someone to take care of him, I mean love. That kind of self-serving wishing is just asking for trouble. So for 2014 I resolve to leave myself unresolved. I accept that I’m a bit impatient because I also get things done. And yeah, I’m addicted to ice cream, but damn it, I deserve that pleasure. Of course, I could always do more for others, but I’m also allowed to take time for myself. And my body could be better, a lot better, but it’s my body and as long as it’s working for me, I need to shut up about my own insecurities and just keep moving. There are many improvements to make, but right now, I accept me as I am, the good, the bad and the ugly. 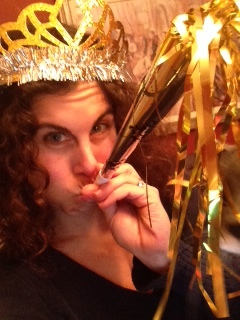 Happiest, sweetest New Year, everyone. Posted in Uncategorized and tagged 2014, Happy new year, new years resolutions. Bookmark the permalink. Amen!!! We work with what we’ve got! Happy new Year!!! Happy New Year, Mama! You’re wonderful just the way you are! You’re quite welcome. Save some ice cream for me, though. ahh, boys are so uncomplicated. love it. two cookies for you! Love this take on things. Unresolved sounds good to me. The best resolution ever! 😉 Happy New Year mama! Unresolved sounds great to me. Resolutions kind of bug me anyway. yes. but who’s miss stacey? Her teacher. Wasn’t that her name? Happy New Year mama! Great essay! Wishing you all your resolutions! One big one…keep writing!! I love resolving to not have resolutions! It’s the easiest accomplishment ever! You are so right! That’s why I am resolving to be me …. To laugh, smile, be joyful, be hopeful. You really can’t go wrong with those things because even if you only smile at one person the whole year you will have touched that person. If you only feel joy over an ice cream cone or the sound of a babies giggle, you will have felt joy! So it’s a win win really! The weight or exersize or whatever else will come or they won’t, but you won’t feel like you’ve failed at your resolutions, and if those other things come you will truly feel like an over achiever!!! Happy new year! i love it!! you’re so right. i’m going to try not to get ‘weighed’ down by the b.s. happiest 2014! !